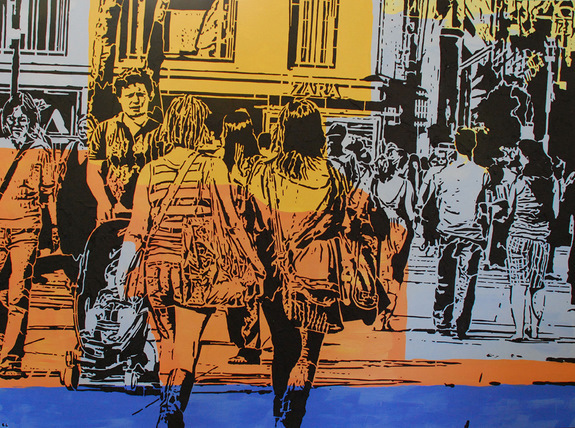 Artist Lucinda Luvaas likes the energy of big cities, especially of New York City, where she grew up and was educated. "There are many ghosts in the streets," she muses, "all those experiences that informed who I am and what made me. The place for me is pregnant with feeling." Paradoxically, the artist's studio -- a low wooden outbuilding adjacent to her 1940's clapboard Hemet farmhouse -- feels utterly remote from the urban chaos, cultural diversity and youthful vibe that energize Luvaas' mixed media relief paintings. Hemet, a sun-soaked and recession-wracked farm town turned retirement town turned bedroom community feels a million miles from Manhattan. Of course, Luvaas and her novelist husband Bill can hop into the car and be at the Santa Monica Promenade in 2 hours, and a day in Santa Monica generally charges Lucinda's creative batteries just fine. In fact, many of the images in her recent series, "The Times of Our Lives," were inspired by images of the Promenade, initially recorded by Luvaas in the form of video and photos, and then lovingly morphed into her distinctive style. "I love to depict the throng of people there," says Luvaas, "and I guess in general it's a motif that repeats itself over and over again. I'm a people painter." Behind the flaking white doors of her studio, Luvaas finds the privacy she needs to create. Working to classical music, and also the hymns of praise that float over from the fundamentalist church next door most evenings, Luvaas fusses over her images, half painting, half sculpting, using sheets of wax to endow her finished reliefs with a raised, reverse stencil surface. The finished works are in some ways paradoxical. They have the graphic energy of "Pop" but seen up close they are quite painterly, even abstract. Luvaas' formalist tendencies are also apparent in the rich, syncopated rhythms of her compositions. 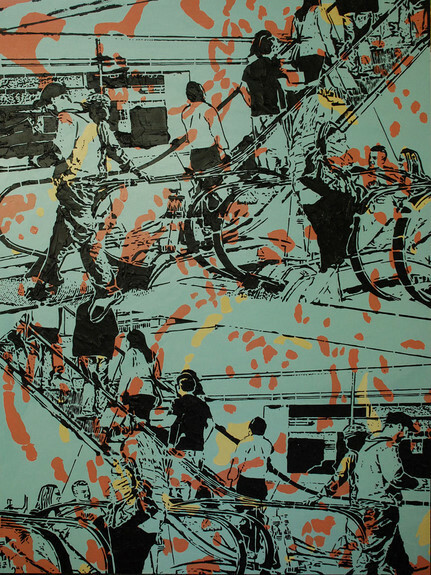 It has taken Luvaas years of experimentation to find her current way of working, and her technique is perfectly fused with its urban subject matter. Luvaas may live and work in the Inland Empire, but New York, where she was born and educated, still feels like her "parent." "I do much work that relates to Manhattan," Luvaas confides, "to the energy that is there trying to lift it up and use it to create that sense of fluidity, energy, creativity and the social aspect of this giant community: one of the very few real communities in this country of ours." A composer, painter, and filmmaker, Luvaas has no trouble keeping the urban energy going wherever she is. "By using that subject matter I become it," Luvaas says. Her art, heartfelt, idiosyncratic and carefully constructed, is an homage to cities and their rich social possibilities. After my visit to Luvaas' studio I sent her some questions about her images, and aesthetics. JS: Lucinda, when you are out looking for images in the world what gets your interest? LL: I've always wanted to capture moments, sort of "Seize the Day," which comes from Saul Bellow's title for his novella. Life issues by so very fast, our gestures, movements, meanings, hopes and dreams, it flees quickly and we are left dazzled by it all. I want to grab these moments and gestures finding meaning and comfort in these short, little recordings. "The Times of Our Lives," is very much engaged with this motif. I look for scenes that mostly depict people moving although at times still in reflection, but movement plays a vital role in my work in terms of its actuality and design. "Trajectory," is a good example of this. I wanted to create a feeling of uplift, and its energy, so I used a repeated scene as a composite to try to create that rhythm. I am interested primarily in capturing people in environments where they are actively engaged in something whether it is simply walking, watching a crowd, dancing, you name it: all aspects of our daily lives and then creating a sort of imprint of history. In fact, I call my relief paintings "imprints," partly because they are relics of something left behind, something of value to our humanity and experience. JS: Is it fair to say that you are walking a tightrope between representation and abstraction in your work? LL: Yes I think it is very fair to say that and perceptive too. I can't tell you how much patterning, design, push pull and all the elements of abstract form play into my work. The stylistic concerns are so very important to me and cause great excitement and pleasure. I've never wanted to depict just what I see, but rather alter things to find a deeper sense or meaning as though I am creating a living being that pulsates and moves with emotions and feelings. This I feel can really be achieved by combining abstraction and figuration. I'm very committed to figuration, but I'm devoted to it within the context of patterning: using abstract forms, to some extent reducing figuration to abstractions, although very much recognizable in their depictions of real things. I definitely am not and never have been a realist. I love the interplay between abstraction and figuration and very much plan to continue my challenge of integrating these two elements into my compositions. JS: Does it surprise you that your work has evolved to tell such complete, detailed stories? LL:No, not really. I've always tended towards narrative and gesture, so this is just a continuation of the same thing, same tendency. As far as complete stories goes I'm not so sure because this technique really just suggests rather than completes. I like suggestion rather than completion. Just throw things out there and let the viewer take creative part in the composition. JS: Anything else that someone encountering your work should keep in mind? LL:These are hard paintings to produce. They are mixed media which means they rely on using different tools and processes to end up with these results. It's a painstaking process, but rewarding. The relief is made with oils, wax, acrylics, and gel and they are on wood panels. I use drawings, video stills from my short video art pieces and digital stills as well for my research materials. "The Times of Our Lives"